The Notes Tab is located to the upper right of Document Viewer. You can access the Document Viewer by clicking on any link to the document in Lexbe eDiscovery Platform, such as from the 'Search', 'Browse' or 'Facts & Issues' pages. Those Notes allow you to keep and share information about pleadings, transcripts and other documents. Notes can be public, so others with access privileges can view, or private, so only you can see them. Select a document by its title either from the Browse or Search pages. The Document viewer will then open a new tab or window in your web browser. (If no documents have been added yet, this screen will be blank). By clicking the document you wish to view, it opens in a new window in PDF format. In the upper right corner of the Document Viewer, the page is divided into four Coded Data ('Doc, 'Disc', 'Notes' and 'Facts'. Lexbe eDiscovery Platform allows you with the ability to add and edit Notes for a particular document. When clicking on 'Notes tab' you will have the option of editing or deleting existing notes or create new ones. When you create a note that exceeds the maximum length of 5361 characters an error message will be generated. First select if you want to order your notes the by Document Title or specific page, when you are reviewing your notes from the Analysis>Case Note page. Please click on the 'New Note' hyperlink to open the Note editor, populate fields and then click on 'Save' hyperlink. First Page:You can refer to which document page the note will be attached. Status:Depending upon the desired availability of the note, it can be assigned as Private or Public. Private: This note can be viewed only by the User making the note. Public: This note can be viewed by the User and by anyone else given access to the account. Note Title: Usually the same title from the selected document opened. Note: Detailed information about the selected document. 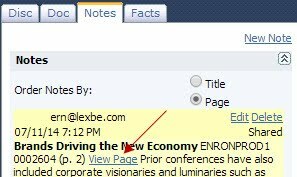 Lexbe eDiscovery Platform allows you to open specific pages of a Document (only PDF files) listed on the 'Notes tab'. To open the page referred on the 'Note Document' click on the hot link 'View Page'. If you are viewing notes from the Analysis>Case Notes page, the column 'Document' will give you a hot link with the document title and the page (e.g. (p.2)) of a note. When you click on the that hot link, the notes will be opened in the Document Viewer>Notes tab the document and its related page. By clicking on Edit (on the right top of Notes window) you can edit or make changes to your notes in required fields and then click on 'Save' or 'Cancel'. You can delete a Note by clicking on Delete on the furthermost right of Notes window. You cannot retrieve the notes once deleted and it will automatically disappear from the list displayed under the 'Notes' tag. If you wish to see all document notes at one time, you can do so in the Case Notes module, discussed here.